I love skunks. Ever since I discovered how useful they are, I started collecting them avidly (ok, not exactly a successful endeavor, I only have three). The latest addition to the brush family is another Etude House brush. The lovely Cathy from Korea Makeup Land CP'd it for me the last time she was in Korea. I was so excited to get her package and when I opened it and found that she had included an extra mask (thanks Cathy!). Remember my rave about the Eye Contour Brush? (If not, read it here) I hoped that this brush would be of equal quality. Mmm, not quite. The fibers are amazingly soft (softest brush I own, hands down). Each hair is really fine, and when I use it to stipple my foundation, I get a perfect finish- it looked so natural and uncakey. However, I found that the brush bleeds a little during washing. 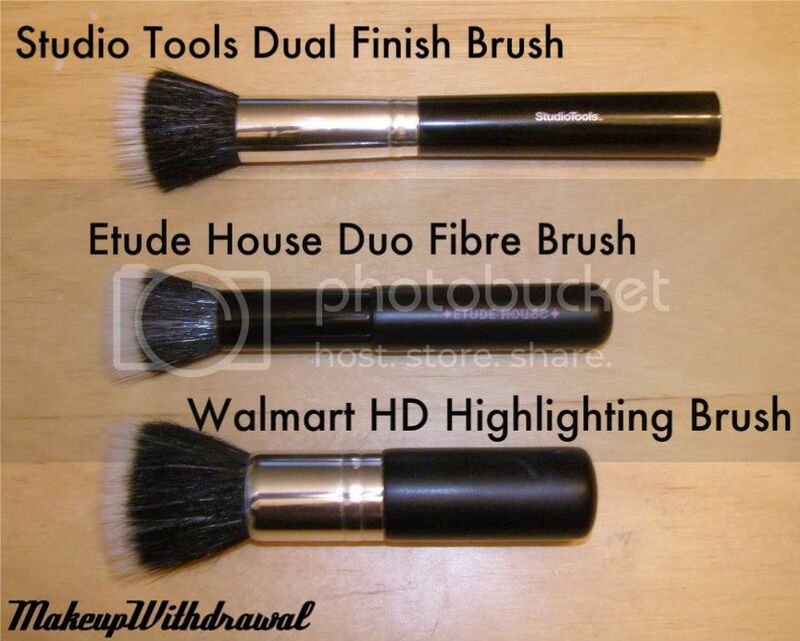 Also, the handle of this brush is the same length as the eye shadow brush. Now, don't get me wrong- I thought that length was perfect for eye work but for my face brushes I prefer something that's a little bit more substantial, so it's easier to grasp. I did appreciate how evenly spaced all the white fibers were and how dense the brush head was (gave me an amazing flush with cream blush). Oh yeah, this brush is made of goat hair and synthetic fibers. We are sorry we could not give you answers to your specific questions! do our best to help! In short though highly responsive, they weren't exactly knowledgeable about their products. Still, it's a pretty decent brush and priced accordingly. So, what do you think? Pretty cute brush eh? OOo that IS a pretty cute brush! how exactly do you use this for eye makeup? i'm pretty much a noob when it comes to makeup brushes!